College is a time in our lives where we're always broke. If you're a college student, you can break the chain and save money while getting a great education. Are you a college student? Are you always broke? Are you nervous about graduating with a mountain of debt? Believe it or not, you can save money, even while you're in college. With the right mindset and techniques, you can come out of college with a better financial position and education. The first step is to set up and follow a budget. Budgeting is important for all ages and all income levels. The process of setting up a budget will open your eyes to how much money you are throwing away and how much you could be saving. Learn how to construct a budget. This will involve counting up your income and expenses. The difference between each value will either be the amount you're going into debt each month if expenses are higher than income, or the amount you're saving each month if income is higher than expenses. As a college student, you probably have fewer expenses than most adults. However, you probably have a lower income as well. Use that to your advantage. Set limits on your spending, even if that means less entertainment. After all, you are in college. You should be spending most of your free time studying and doing school work. This is the most important thing you can do that many people give up on. The budget is too hard so they stop. This will only hurt you in the long run. If the budget is too outrageous to follow, tweak it and adjust it until it's something you can manage. Some people do not work during the semester in college because they are trying to focus on school. There is nothing wrong with that, especially if you have a heavy workload. However, if you have free time, you can work at a part time job. Look around the community at your college for part time work. Chances are, the local businesses hire a lot of college students during the school year. Start your own business, babysit, etc. Do whatever you can to bring in more money as long as it's not affecting your schoolwork. Use the money from your part time job to pay for your regular expenses and save the rest. If your college tuition is paid for, save the money. Could you imagine graduating from college with money saved and no loans? That is unheard of! Use the extra money to pay for your college expenses if they aren't paid for. Either way, it's a step in the right direction to help your financial future. Even if you don't work during the school year, nobody has an excuse not to work during the summer. A paid internship is ideal because you are getting career experience and getting paid, but an unpaid internship is still worthwhile for your future career. Get a full time job and a part time job. You're not doing anything, you might as well work. You could potentially save up enough money in one summer to pay for an entire semester at a state school or a good chunk of it at a private school. College is a time to learn, but don't think that stops at school. Learn about budgeting for college students, how to manage your money and how to set and complete financial goals. It will set you up for graduating into the real world. 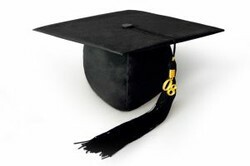 Get your diploma and graduate with a good financial education. If you're in high school and preparing for college, this is a great time to start applying for scholarships to help pay for college. Look for scholarships through your school, in your community, at your desired college, and online. If you're in college, you can still earn scholarships. Lots of people don't realize this. They think that just before college is their only chance. That is not the case. Keep looking for scholarships throughout your college education. As long as you have tuition, fees, room and board, and books to pay for, scholarships should always be in the back of your mind. Keep looking and listening. If you want help finding and winning scholarships, watch the video below. Ah, very true. Being in college means studying. But we should not forget to attend the university's student night or our department's student party. :) Other than that, we should focus on studying. :) Right? As for budgeting, I always made sure that I save so that I can buy that trendy blouse or that gorgeous sandals. :) If I kept on doing this, I wouldn't have met the folks at <a href="http://www.debtrescue.com.au/">debtrescue.com.au</a>.